Nancy Drew was always vexed by her cases. Judy Moody was vexed and perplexed. Which was just a fancy-Nancy way of saying stumped. "Jeepers! I think I've got it!" Judy cried. Jeepers, book blog chums! Hop in the roadster and let's do some sleuthing! Judy Moody's got the Nancy Drew fever and is reading all 56 titles in the series. And when Judy gets the fever, the whole neighborhood has an epidemic! Judy can't wait to find a real mystery to solve, and when Officer Kop's police-dog-in-training, chocolate Lab Mr. Chips goes missing, Moody, a.k.a. Judy Drewdy, alias Liz Inkwell, quickly swears in little brother Stink (a.k.a James Madagascar), and friends Rocky (a.k.a. Spuds Houdini) and Frank (a.k.a. Dills Pickle) with the Nancy Drew oath. It seems baloney sandwiches and chocolate chip cookies have been disappearing all over town, and the connection to the missing Mr, Chips seems elementary, my dear, to Agent Inkwell. In her persona as girl detective Judy goes about town interviewing witnesses and looking for clues at the scene of...well, food disappearances, spouting retro girl sleuthisms. Still, her Drewisms don't seem to be turning up any useful clues. Judy Moody was in a mood. An UN-detective mood. A bummed-out, not-Nancy Drew mood. Mystery UN-solved. Then Judy has a mysterious moment of truth. Girl sleuths can't afford moods. They never give up. Judy comes up with a plan. Taking a page from The Mystery of the Moss-Covered Mansion, she decides to lay a trap with chocolate chip crumbs to attract the thief. and she and her gumshoe chums set up the surveillance until the crook appears. The case is as good as solved. 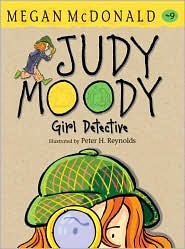 Megan McDonald's ninth book in the best-selling Judy Moody series, Judy Moody, Girl Detective (Book #9) (Candlewick Press, 2010), is a bit light on clues, crime, and punishment, but long on fun for the beginning chapter mystery reader. As always, Peter Reynolds' pen-and-ink drawings break up and enliven the text with his own brand of visual humor, and readers who are at all familiar with the Nancy Drew books will get a kick out of McDonald's witty allusions, even making the fictitious hack author's name (Stratemeyer) the name of a minor character.